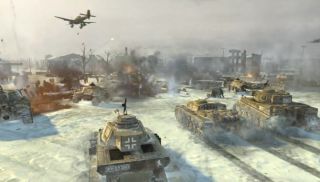 Company of Heroes 2 trailer suggests you hold off on "the next big FPS"
While the last trailer was a sombre exploration of the psychological and physical toll of the Eastern Front, Company of Heroes 2's latest video preview is a more celebratory look at the variety and flexibility of the World War 2 strategy. It's cocky, too. Confidently rolling its tanks over that other genre's battlefield; big block letters proudly instructing you to take command " before you try the next big FPS". Luckily, it seems, the RTS sequel has the fire-power to match its assured taunting. You can see what Relic have in store with our hands-on beta impressions and huge preview .